Hi, I am interested in your 1978 Dodge Li'l Red Express (stock #4578-CHA) listed on Autotrader for $29,995. I'd like to get more information about this vehicle and confirm its availability. Its fun to be the outlaw, and none did it better than the rare 1978 Dodge D150 Lil Red Express. With its big V8, side stack exhaust, and cool wood package, this is absolutely distinguishable. So look over all the details, but you already know this red-hot truck is a fast-moving classic. The story goes that the folks over at Dodge figured out how to return the muscle car era. While emissions regulations controlled cars, the truck market was still able to get some hot packages. So if they were going to be outlaws, they were going to be brazen. The Lil Red Express lived up to its name with Bright Canyon Red paint and full gold tape stripe package. Its believed that there has been a nice investment in these colors and, and quite frankly, we understand why. After all, everyone who knows the legend expects the truck to look this good. 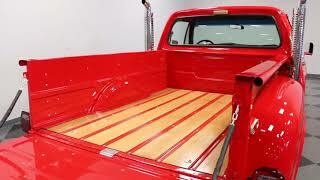 While the logo on each door was pretty bold, its nothing compared to the real wood applied to the side of the step-side bed and the tailgate. The Mopar boys still had more tricks to complete their standout package. Bright chrome bumpers, a bright chrome grille, and those amazing vertical exhaust stacks made people stand up and pay attention. While this total package was instantly attractive, few people could pay the high price. This is a rare example with only 2,188 Lil Red Express trucks produced in its inaugural year. Inside, the interior does a good job of preserving tradition. The black looks right for a muscle truck, and the seat has even been recovered in the correct Dodge pattern. Youll slip behind the classic Mopar Tuff three-spoke sports steering wheel. Beyond that is the classic driver-oriented dash with all the essential controls at your fingertips. We know youll want to be driving with the windows down all the time to listen to those vertical stacks. But just in case you need a little extra breeze, this truck comes with provisions for air conditioning. The true outlaw nature of this pickup comes from whats under the hood. Mopars strong 360 cubic-inch V8 was already a great motor to start with, and the Lil Red Express took full advantage of looser emissions regulations. And yes, those vertical exhaust stacks really do give this a unique high-rise, high-performance soundtrack. More than just a mean V8, the whole presentation looks great. The blue block, bright valve covers, and matching air topper stand out nicely against the red painted engine bay. Plus, the thick front sway bar, strong Torqueflite A727 three-speed automatic transmission, power steering, and front disc brakes do a great job of making this powerful pickup an easy cruiser. This is a turn-key ready head-turning rare classic. So when you can find this performance pickup for such a nice price, you know you need to act fast. Call now!